What a day yesterday at TOFT for me and 'Bird-box Billy' aka Edward Lord. 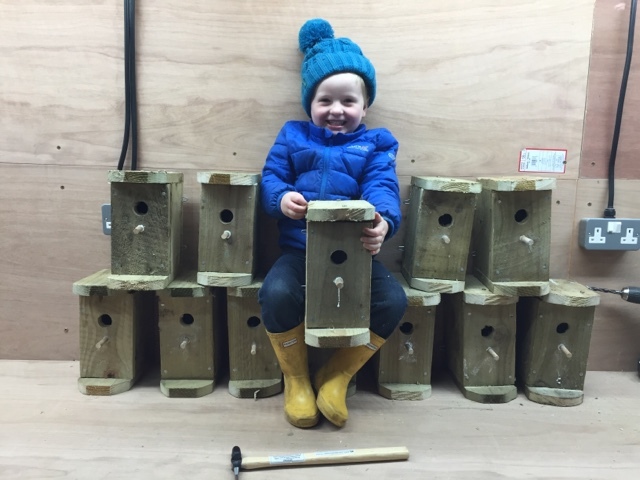 Together we knocked out a dozen new bird boxes and a bat box in Grandad's new workshop. It's rustic high rise accommodation for the bats and wee birdies at TOFT this season. 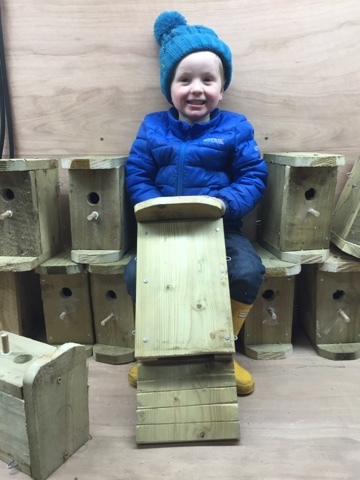 And the bats well...first time we've ever made a bat box. The joy of explaining the mechanics to my three year old apprentice was simply priceless. "They land on the bit hanging down, grab hold of the wood, then crawl up the hole Dandad?" Apparently he told his Daddy all about it when he got home and he had it all right too. Will the bats take up our offer of free accommodation? We shall see. Widdy is a great Glue man dipping the perches in the white stuff and then putting them in the holes. Then of course he tested each one for robustness with his new hammer. "They all passed the test Dandad"
The wee birdies will be spoilt for choice deciding where to live at TOFT this season. We got half a dozen hung up last night before light stopped play and hopefully we'll get the rest up tonight when he comes in from nursery. It simply must be done. Perfick!